Well, as quite often happens T4rdis2 and her occupants have found themselves in a lonely spot up on a pedestal with far ranging 360 degree views over open countryside with only a few corpses of trees and a huge lake in sight. So you might ask 'why have they gone there?' And the answer would be that it provided a free and convenient place to stop on our continuing journey North, but additionally, the lake is famous for it's bird life, particularly cranes! However, we thought their migration would be over because the birds start to arrive around April, but more come later depending on where they over winter, so there were still a few stragglers about along with what seemed like millions of greylag geese and several other varieties of water fowl. 1. The crane has a red spot on it's head - it's blood that can be seen because the bird hasn't got any feathers on that bit! 3. The crane has a wing span of 2 metres. 5. The record number of cranes at Hornborga was measured on 3rd April 2012 when 26,500 birds were recorded. 6. The cranes fly from Rugen in north Germany to Lake Hornborga in one day and with the use of thermals they can reach speeds of 70 - 80 km/hour. Apparently, in spring and autumn 10,000 cranes visit this area to rest during their long migration to their breeding grounds, but along with them about 150,000 'twichers' and other breeds of human come here to watch the cranes hopping around in what is called their lively dance! From the info boards we learnt that in the past there were endless potato fields around Lake Hornborga so a plentiful supply of frozen left over spuds was to be found in the fields, but this crop was stopped in the 1970's. 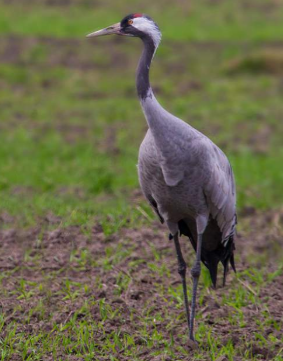 However, the birds still came because each evening (in season) about a ton of grain is specially laid out for them, and additionally the cranes also forage for frogs, small fish, insects and plants - it sounds as if they really do enjoy a good healthy diet! The lake itself covers 28 sq kilometres but it is also surrounded by huge areas of wetland and grassland, so as well as bird life there were also lots of other things to see like cute bunnies, and I'm fairly sure if we keep a look out at dusk we might well see plenty of other creatures as well. However, dusk doesn't arrive in this neck of the woods until about 11.30 so the chances are we'll be 😴😴😴 by then. Well, what a change!! We've gone from a scorching 27 and more degrees down to around 14 and the rain has come down in torrents both overnight and intermittently this afternoon - however we have managed to stay mostly dry. 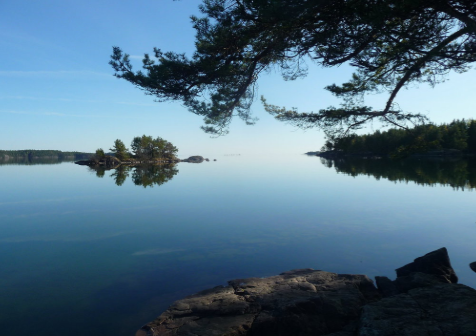 This morning we left our free camping spot and headed for the town of Falkoping for a refuel and restock and although we knew things would be dearer than at home it wasn't too painful. Diesel was the equivalent of about £1.30 and although food was a bit more expensive than in England it wasn't too bad. Then once that chore was done we headed back towards Lake Hornborga but this time to their visitors centre. There we found loads of info, several telescopes which were sighted onto the lake, nature trails, and also a board walk out to a viewing platform that provided superb views for many miles over the water. However, by this time the skies were darkening and the wind was howling so we took that as our signal to nip back to T4rdis2 for lunch. An Armada of Geese but there were literally thousands!! Unfortunately, after that the weather didn't get any better so rather than endure a soaking we decided to press on to our next destination which was the town of Karlsborg (which has absolutely nothing to do with beer). Once there we parked up at the camper stop on the marina, and once the rain had stopped we went out to stretch our legs and explore the lake areas. We're actually parked overlooking Lake Vattern but the area is surrounded be lakes and waterways which are all interconnected by the Gota Kanal which eventually spills out into the Baltic Sea. And even on this overcast dull day the area looked very beautiful and we could easily have spent another day here exploring, but we've still got an awfully long way to go and lots of things further North that we want to see and do. Therefore we're going to press on again tomorrow but then maybe stop for a day or two at Borensberg from where the Gota Canal goes in both directions! T4rdis2 is now parked in a camper stop right at the side of the Gota Canal with just a quite cycle track separating us from it! For company we've got a few honking geese, a few squawking gulls, and several little families floating quietly by! And since we arrived we've done little more that take a walk around the small town of Borensberg and then sit one the edge of the Canal to watch what happens down on the river bank - it's really been quite sleepy! However, while we were out we did learn a little more about the Canal itself so here's a bit of a potted history. Apparently it's 190 km long and was built between 1810 and 1832 by a total of 58,000 Swedish soldiers who dug 87 km of it by hand. 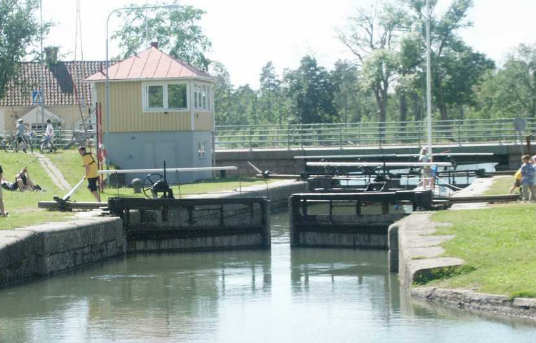 It holds the accolade of being named the Swedish Construction of the Millennium, and it stretches between Mem on the Baltic side and Sjotorp on Lake Vanern and it has 58 locks along it's way. While we were out we also stopped to soak up the atmosphere by the old Borensberg Lock which dates back to 1820 and is one of only 2 on the canal that are still manually operated. The rises here is only a little under 8 inches but operating it was keeping the lock keeper very busy! Well, at the risk of being boring today's episode is going to be a bit more about the Gota Canal because 🚴🚴 along part of it's length was today's activity. However, before we left T4rdis2 we had debated about the wisdom of going as far as we did because the fairy story the weather man had told had predicted heavy rain and thunder for the early afternoon. But undeterred we left T4rdis2 early (10 ish 😂) and we were soon cycling along with the dazzling water on one side and lots of tall gracious oaks on the other. Apparently there are 10,000 trees on the canal's embankments which makes the canal the world's longest avenue 😲 and the purpose of the trees was two fold! They were mainly planted because their roots protected the embankments from erosion and water leaks, but their crowns also provide shelter and shadow, originally for the many workers on the tow path, and more recently for cyclists and sailors who navigate it's waters. Another amazing fact about it is that it's the second longest cultural heritage site in the world - the only longer one is the Great Wall of China! Along our way we also saw 6 rolling bridges which are remotely opened from the town of Ruda when tall masted ships want to pass by! The one we stopped to watch was at Sorby, but it wasn't an original! There was a wooden bridge there in 1825 but that was replaced in 1848 by a bridge of iron and oak, then electrification came in 1953 and the present bridge was only put in place in 1970. After about an hour and a half of peddling we reached our target which was Lake Roxen from where 11 locks raise boats a little over 29 metres from the Lake onto the Borensberg section of the Canal. They were built between 1815 and 1818 and are divided into 3 flights - The Carl Johan Locks, The Oscar Locks and The Berg Locks. Obviously they would all have been manually operated originally, but the job became much easier when they were electrified in 1969. When we arrived it was still only a little after mid-day but the edge of the Lake seemed to be the perfect place to sit and scoff our lunch - and that was mainly because there was entertainment thrown in as well!! That came in the form of sailors trying to manoeuvre their boats into the bottom lock with a brisk wind to help 😱, and also the little sparrows who had no fear and tried to steal our food right out of our hands! After that all that was left for us to do was to retrace our tyre tracks homewards, but this was done at quite a brisk pace because by now black clouds were gathering and there was even just an odd spot of rain! However, it never amounted to much, and as long as we peddled fast we managed to keep ahead of anything inclement, and by the time we got home the sun had mostly won the battle. Tomorrow we're going to move on again in a northerly direction - destination yet to be decided!